I’m sure plenty of us who have been around Neopets for a LONG time remember the old mobile app on old cell phones. If you were young when the app came out, you begged your parents to get it on their phones so you could play with your pets on the go. And if you were older, well you probably had the cell phone to play on! If this is all completely new to you and you thought the 2014 Neopets Mobile App was something exciting and never before seen, you’re in for a treat! Right below you is a guide on anything and everything having to do with the old app! The Neopets Mobile launched on 28 June 2006 and was unfortunately discontinued only three years later. If you were able to access the app on your mobile, you had exclusive content at your fingertips! And what, you might ask, was this oh so exclusive content? Okay okay, now you’re thinking “Gee, what’s so great about a Lutari? Sure they’re nice pets and all, but you can’t even trade them!” But at the time the app was released, the Lutari was a brand new pet with a brand new place to explore and brand new things to do. You’re probably thinking about how much fun it would be to visit Lutari Island right now! But don’t forget, it was discontinued… We can all cry here, it’s acceptable. So many people missed the chance to play with the mobile app, and if you’re really bummed out about that, why don’t you keep reading even more information about the exciting island you can’t visit! Oh, and just in case you haven’t realized, the reason why a strange person on the internet is being mean to you is because Neopets is releasing a new mobile app that could very well include Lutari Island! So don’t worry, you might have the chance to visit very soon, but for now, read more about it! If you’re even remotely familiar with Neopets, these activities won’t really surprise you. They were very similar to already existing attractions on Neopets, but they did have a few unique perks! Briana was the Faerie of Lutari Island and just like her sisters, she gave out quests to those visiting the island. However, the quests were extremely rare, perhaps as rare as our beloved Fountain Faerie’s quests. And you can expect that if that analogy is used, Briana’s quests must have been worth it! Some of these items included Codestones, bottled faeries, exclusive Battledome gear and much more! Some of her rewards were more common than others, like her usual neopoint award and stat boost. 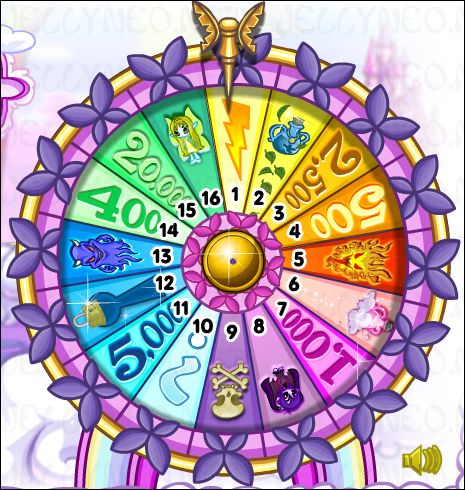 Similar to the Wheel of Excitement (pictured to the left), the Wheel of Happiness was a way to win some cool items or neopoints on Lutari Island, as well as find yourself in the middle of a peculiar random event! You could spin every 30 minutes. Unfortunately, since Lutari Island can’t be accessed by anyone anymore, there are very few pictures of the attractions and therefore if you haven’t used the mobile app, you might not ever know what the Wheel of Happiness looked like. How tragic! Maybe the new mobile app will help a buddy out? 10,000 – Congratulations! You’ve just won 10,000 Neopoints! Evil – The Night Dweller attacks and steals your PetPet! 1000 – Congratulations! You’ve just won 1,000 Neopoints! Feather – A feather floats from the sky. Hmm…perhaps it has a use? Lose NP – The Night Dweller attacks and steals X Neopoints! Whoops – You trip and fall while watching the wheel spin, losing half your hit points. 500 – Congratulations! You’ve just won 500 Neopoints! Happy – Your Neopet is now delighted! Item – Congratulations! You won an ITEM! Heal – Your Neopet has been fully healed! 250 – Congratulations! You’ve just won 250 Neopoints! The Lutari Island Market was always a favorite for some people, as it sold a number of rare items at wwonderfullylow prices! Many people would restock, or buy items to resell them for a higher price, and turn a profit from this little shop. Some items could be sold for almost ten times their original price in the shop! However, when items restocked, or added to the shop, some had a higher chance of showing up than others, making the less likely to restock items all the more rare! 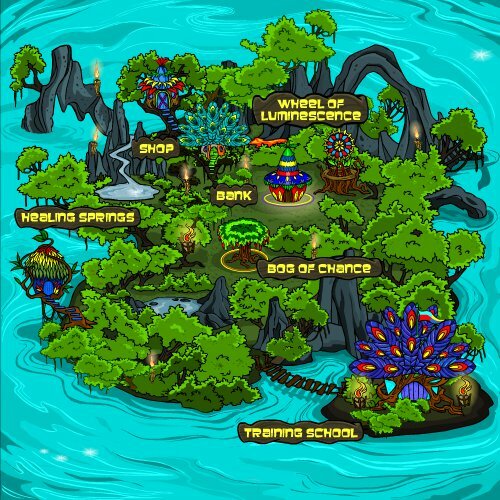 The Survival Academy was Lutari Island’s own training school, much like the Swashbuckling Academy or Island Training, also requiring its own type of payment other than neopoints. If you wanted to train your pet, you needed feathers, which at the time could be acquired very easily on the island as they were commonly available in many different places. Unfortunately, the only way to ensure your pet kept training was to leave the game running on your mobile, because if it was switched off, the training would stop. That was definitely inconvenient for most people who wanted a new way to train their pets! Just in case you wanted to know what was going on in the real world of Neopets, you could open up the Island Gossip section and get the news update! Like the regular news page we can see online, Island Gossip would give you any information The Neopets Team wanted to share with its users. You might get an update telling you it was Techo day and there were exciting Techo-related things to do! The Fluorescent Pools were very similar to our own favorite place to chill after an intense battle, The Healing Springs. You could visit very frequently (there is some discrepancy between the exact time intervals you were allowed to visit) and get your pets healed up and ready to go for another fight! Unlike the Healing Springs, you couldn’t buy potions at the pools and instead your pets would have some of their hit points back, sometimes even more than the Healing Springs faerie would give you! The Bog of Charity was like Neopia Central’s Money Tree, ready and waiting to give you some pretty darn cool items! (Or maybe not…) We all know the Money Tree stiffed us a couple of times, so if you were lucky enough to get yourself some Sparkling Bog Water (pictured to the left), you really knew you’d make it big. Except bog water is totally gross and why would anyone want it? Along with an award of neopoints, bog water was the most common prize from the Bog of Charity. However, there were plenty of other extra special and super rare prizes you could get! You can even find a lot of these items with the Shop Wizard because they’re still in circulation. How cool! The Lutari Savings Bank was exactly what you might expect it to be, a bank just like the one we all use in Neopia right now! You could deposit and withdraw NP as well as collect your interest! And since the island bank functioned like the one in Neopia Central, your account type would be the same on the island as it was in town. For example, if you had a Millionaire Mega-Platinum at home, you would also have it on the island! If nothing you’ve read so far has even slightly interested you, you’ll at least be happy to read that there were some games you could play on Lutari Island! Two games were available to win neopoints and you could play them each ten times a day. Go Go Lutari! (pictured on the left) was similar to Turmac Roll and had controls that easily corresponded to the keys on your mobile. Blockstravaganza was the second game available, but did not run as well as Go Go Lutari! The premise of this game was to eliminate blocks by getting three of a kind in a row. There are a few reasons Neopets probably decided to discontinue the mobile app, and even though it was popular with some people, it was probably the right decision. As technology progressed, the app was easily left behind as the then popular Razor flip phones started to come up short in the cell phone competition. Now we’re in the age of smart phones, so could you image something this rudimentary in comparison to all the iOS and Android apps competing with those same apps? The app was also pretty difficult to deal with sometimes, causing way too many glitches to be worth much anymore. It’s also possible that the company in charge of Neopets at the time, Viacom, was not profiting from the app as much as they had hoped, further pushing the idea that a shutdown was a good thing. Now we can no longer visit Lutari Island and even though you can find it on the map of Neopia, all you’ll find is a great big storm. Hopefully the island only has a little more bombardment by this storm left and we’ll be able to visit the island, sunshine and beaches, very soon! Head over to the Neopets App Discussion or App Leaks pages to find out more information about the new Neopets App! My only way to start playing neopets again after a 7 yr break is on my IPhone. Will I be able to at least do minimal things until I get a new notebook and can get the pay version again? Or should I just wait until then? I have always loved all aspects of Neopets but I don’t understand by these vague explanations about the mobile apps if I can even create a Neopet to play with. How does this work for IPhone? Had to switch to an iPad. Now I am Unable to play games, visit by map or buy food. What do I need to do to receive full access to neopets?